Towards the end of 2017, I left a full time job to give consulting a try. As January and February unfolded, I finally started getting enough billable hours to make a go of it. A full time job offer found its way to me a couple of months later and I decided to take it. I never announced it here or on social media, but my employer is now Ntirety. I'm a "SQL Server consultant" according to the HR department. It's mostly DBA-type work, but I am doing some occasional SQL development, C# development, and PowerShell development. I'm also doing a fair amount of T-SQL optimization, which I enjoy greatly. Like many of you, I've taken an interest in Data Science. I began learning R earlier this year, and I started a new blog Zero To R to document some of my learning. I've only posted 16 times so far, and to be honest, the blog has stalled a bit. Hopefully that changes soon. At the end of June, I passed Exam 70-767: Implementing a Data Warehouse. If you wish, summon the vast powers of certification and read about it here. Sadly, I missed PASS Summit 2018. It's the second year in a row I've not been able to attend. The dates for 2019 look agreeable, and I should have enough PTO to make it work. Maybe with a little luck, I'll even make it to SQL Saturday Portland the weekend before. 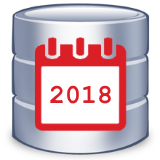 For 2018, I made it to a handful of SQLSaturday events: Tampa (1st time), Jacksonville (3rd? ), Atlanta (2nd), and Louisville (2nd). Geographically, I'm in a decent location with many SQLSaturday locations within driving distance. Maybe South Florida and Panama Beach in 2019? Oh, and then there's SQLSaturday Orlando. 2018 was the second time I lent a hand with Andy Warren and the other organizers. It's tough work--and kind of stressful when you're responsible for the big event. I haven't been much of a GitHub user and contributor over the years. But I did make my modest SQL to Excel project available there. It seems to be well received--special thanks to everyone at Brent Ozar Unlimited for promoting the project in your newsletter. There were also a few snippets of PowerShell I included with my SQL Server Features Discovery Report post. The folks at dbatools turned it into the Get-DbaFeature cmdlet. Very cool! I got to meet a number of people face-to-face for the first time this year, mostly at SQLSaturday events. And of course it's always nice to catch up with old friends too. A lot of you are on Twitter and listened to my rants about UCF and ... and ... OK, mostly UCF stuff. Thanks for sticking it out with this college football fanatic. Slack has been a good place to stay in touch with friends and make new friends too. The conversations about SQL, R, PowerShell, and anything else imaginable are fun and informative. There are so many people there willing to share their knowledge and experience in support of others in the community.